Experience the life of a Navy sailor at the Battleship USS Iowa Museum in Los Angeles. Recognized as the world’s greatest naval battleship, the formidable USS Iowa — once host to three US presidents — now educates visitors of all ages through interactive exhibits. See what life was like during its many years of wartime service, including World War II, the Korean War and the Cold War. Knowledgeable guides are on hand to point out highlights including the Admiral’s bridge, main guns, missile decks, mess areas, captain's cabin and crew quarters. 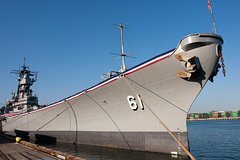 Head to the easily accessible Los Angeles waterfront in San Pedro and use your ticket to tour the Battleship USS Iowa Museum. Designed to stop wars, not start them, the USS Iowa served the US for more than 50 years and was known as the “Battleship of Presidents.” See where Roosevelt stayed and planned WWII strategy in the stately captain's cabin — complete with the only bathtub on a US Navy ship built specifically for a president. At this family-friendly attraction, discover the evolution of this flagship of the fleet, which boasts a new role today as an interactive classroom. Via film footage and exhibits, you'll see the Battleship USS Iowa as her former crews saw her. Wander the same wooden decks and bridges, and explore the iconic ship’s interior spaces where elite Navy sailors performed their duties during the Korean War and the Cold War. Witness the battleship's big guns and Tomahawk and Harpoon missiles, see the crew quarters, and learn more about life at sea from onboard tour guides — many of whom are US Navy veterans. Kids can even participate in a fun scavenger hunt to find the ship’s mascot. Tour this vast ship — the West Coast's only battleship open to the public — at your own pace. You'll find much to educate and entertain the whole family on this mighty vessel.